Electrode-GX is a spiritual successor to Electrode-ex from EX Firered & Leafgreen. It is a Stage 1 Lightning type with 190 HP, weak to Fighting, resist Metal, and retreat cost of 1. Most aspects from the older card still remains the same, save for adding a filler attack of Electro Ball, which does 50 damage for LC. Crush and Burn has been cursed by being a GX attack as opposed to being a repeatable attack. It also costs LC and does 30 damage, and lets you discard any energy from your Pokemon, and deal an additional 50 damage for each energy discarded. Even though you burn a GX slot, it synergies well with its ability, Extra Energy Bomb. This ability stays true to the original: you get to Knock Out this Pokemon and you put FIVE Energy cards from the discard pile to your Pokemon in any way you like. The extra bit of text excludes Pokémon-EX and Pokémon-GX, in a similar vain to the old Electrode-ex excluding ex Pokémon. Speaking about EX and GX Pokemon, Electrode-GX is worth two prizes, so if you use this ability, you’re giving your opponent two prizes. The wording makes it that Special Energy are allowed to be selected and used. Perhaps the most ridiculous thing you can fetch back in the day is Scramble Energy, as four of them means 12 units of energies are provided when you are behind on prizes! Now? The best thing to fetch for this present time is Counter Energy and Double Colorless Energy. Counter Energy is very much like Scramble Energy, except that it provides 2 units instead of three, but can work on not just Evolved Pokemon, but also Basic Pokémon as well (obviously is excluding two-prize variants). Double Colorless Energy is awesome for Pokémon with DCE friendly attacks! While it is unfortunate that it excludes EX and GX Pokemon, Stage 1 and Stage 2 GX Pokemon may have a workaround while EX Pokémon and Basic Pokémon GX are completely out of luck. The idea would be to attach energies to the basic or stage 1 prior to evolving into a GX, and that makes the restriction somewhat inconsequential. That still wouldn’t be good for GX Pokemon already in play, but at least you have to mind your timing and plan accordingly to make sure you get the desired setup. Giving up two prizes is still painful; you need to be sure you can capitalize on the ability to deliver enough pressure to overwhelm the opponent. Overall, this is a good card because of what it can do for others. The older Electrode-ex was part of Ross Cawthon’s BombTar deck that took 2nd place in 2005 World Championship (same guy that also placed second on 2011 Worlds with a rogue deck called The Truth), so I am confident that Electrode-GX can do a similar thing in present time. It just need partners that are very good attackers like Dark Tyranitar back in the day. In Limited, this is a risky Pokémon to capitalize on the ability, maybe because you start the game with 4 prizes, and not many things go in the discard pile immediately. Notes: So, here’s an analogy. Extra Energy Bomb is to the TCG while Belly Drum is to the games. Both demand a hefty cost in exchange for an extraordinary effect, but then your job is to pick the right moves in the games and the right partners in the TCG to do the rest of the work. It is a combo card, so I cannot give it too much credit when it comes to scoring this card, and considering that you need Voltorb to evolve it. Other factors such as ability lock might prevent you from setting up. Electrode GX (CES 155) looked primed to blow up the Standard format when it came out of the Celestial Storm expansion set. Alright, maybe not blow up but certainly create some interesting possibilities with its ability Extra Energy Bomb. The pendulum swung back and forth for me with this card. I initially quickly dismissed it, but then I circled back and thought about it some more, considering that accelerating any five energy cards – not just Basic energy – could potentially put some high cost archetypes into the range of being reasonably possible. You could even attach Counter Energy, since you’ll almost certainly fall behind in prize cards after executing Electrode GX’s ability. At least you can still potentially attack during the same turn in which you use Extra Energy Bomb. And the fact that it requires you to use non two prize Pokemon means that your opponent still has to KO four of your Pokemon. If you’re able to sneak a GX in at the end, too, when you only have a single prize card left, it’s almost like Extra Energy Bomb only cost you a single prize. Unfortunately, the ability dictates that you pull the energy out of your discard pile and not your deck. We’re definitely getting a card from Lost Thunder that will help put stuff in the discard in Zebstrika, and the non GX Shuckle could help with that too, and we do have Ultra Ball and Sophocles and other ways to discard as well, but it’s hard to get five energy into the discard in the first two turns of the game. And you want to use Extra Energy Bomb ideally on turn two or three at latest. The longer you give your opponent to set up, the less of an advantage Extra Energy Bomb becomes. If it allowed you to pull energy from the deck, I think I’d be more interested in this card, but considering it costs two prizes and is countersynergistic to itself, I’ve passed on Electrode GX. I’ve had more success with Dragon’s Wish Dragonair, and I’m looking forward to trying out some of the acceleration options coming out of Lost Thunder. Especially with Lost March on the horizon, you just can’t give up two prizes for only five energy cards. Maybe if it allowed you to attach all of the energy in your discard or pull the energy out of your deck, but as it is, Electrode GX is more likely to blow you up than your opponent. Welcome to one of the current timebombs in the Pokémon TCG: Electrode-GX (SM – Celestial Storm 48/168, 155/168, 172/168). I’d love to say that it is only a matter of time before this explodes onto the scene but just as with an actual bomb, this one could be a done that may not even sputter. At least, in the Standard Format; in Expanded, Electrode-GX can hang out in the background indefinitely. All of this stems from its Ability but we’re going to run through the rest of the card first, as said Ability takes a lot of explaining. The [L] Typing isn’t too significant, though that has a chance of changing with the release of SM – Lost Thunder, as the set has some nifty [L] support. From what I’ve seen, I’m not sure how much of it will really matter for Electrode-GX. Its status as a Pokémon-GX is actually extra significant for the obvious reason. The Ability also makes its Stage rather significant; being a Basic might make it into near-universal TecH while being a Stage 2 would probably kill any chance it had of being worth the effort. Electrode-GX has 190 HP, making it about as durable as a Buzzwole-GX; Electrode-GX has a worse Weakness – [F] – but the [P] Weakness of Buzzwole-GX is no picnic either; Buzzwole-GX is a Basic Pokémon instead of a Stage 1, however; I don’t think we’ve seen a Stage 1 Pokémon-GX with less than 190, and most other”small” ones have 200 or 210. The Metal Resistance is appreciated, as something is better than nothing and [M] Type attackers have had some success (just not a lot lately). The Retreat Cost of [C] is affordable, though I’m not certain it’ll need to retreat all that often. BOTH attacks require [LC]. “Electro Ball” is a straightforward 50 damage, which is unimpressive for the cost but not terrible. “Crash and Burn-GX” is actually pretty good; besides the upfront cost, it gives you the option of discarding as many Energy cards as you want from your Pokémon in play, each adding 50 damage to the attack’s base 30. That base damage is too low: unless something else requires you burn your GX-attack, you have no reason to attack unless you also discard at least one Energy card. Still, if you have the Energy to burn, it can hit the numbers, with five Energy cards (Double Colorless Energy is only worth 50 damage, not 100) you swing for280 damage, so only extremes like Wailord-EX WITH a Fighting Fury Belt attached survive. Finally, we get to the Ability, “Extra Energy Bomb”. This Ability is a little tricky, due to what it does and how it is worded, so we’re going to run through the text bit by bit. Extra Energy Bomb states it can only be used once during your turn before you attack but like most effects with this clause, it actually means you may only use each instance of the effect once per turn. For example, if you have two copies of Electrode-GX in play, each has one use of Extra Energy Bomb for a total of two that turn. When you use Extra Energy Bomb, first you attach five Energy cards from your discard pile to your Pokémon as you like. It doesn’t say “up to” so the only way to attach fewer than five Energy cards is if you have less than five in your discard pile. It doesn’t specify an Energy Type or even restrict itself to just basic or just Special Energy. You can distribute the attachments however you want, though you do have to attach to at least one Pokémon and you can’t attach to more than five different ones, given you only get to attach five Energy cards total. 1) Attach the Energy to a lower Stage of Evolution. 2) Use another effect to move the Energy. 3) Use another effect to swap out the Pokémon. The first won’t work if you’re using something like Archie’s Ace in the Hole to play a Pokémon-GX Evolution card directly to the field. The second and third don’t have any good options in Standard, though in Expanded we have Scramble Switch for a one-time movement of any and (up to) all Energy, while Ninja Boy allows any Basic to swap places with another Basic from your deck. Wait, there’s more! The final effect of Extra Energy Bomb is that the Ability KO’s the Pokémon that used Extra Energy Bomb, so to pull all of this off, not only will you need Energy in the discard pile (preferably the exact five you need), a Voltorb, an Electrode, a turn to Evolve, and at least one Pokémon to which you want to attach all that Energy, but your opponent takes two Prizes (one if you can slap a Life Dew onto Electrode-GX). Is there any place where this is good, let alone great? I… don’t know, but I’ll explain why I think it safe to assume there will be at least one competitive deck that arises from all of this: Electrode-ex (EX – FireRed & LeafGreen 107/112). This card received both hype and skepticism when it released in August of 2004, but a year later it finally proved itself in a deck built around Dark Tyranitar (EX – Team Rocket Returns 19/109) and Dark Tyranitar (EX – Team Rocket Returns 20/109). YES, two different versions of the same Pokémon. While the deck didn’t win worlds, it secured second place in both the Seniors and the Masters Age Brackets. While the winning lists didn’t use all of them, part of this was about utilizing various cards with effects that reward you for having more Prizes left in play than your opponent. Of course, the other important thing was having huge attacks with huge Energy requirements but lacking a better source of fuel. “Better” can and does include when the metagame is calibrated for what would otherwise be a better source of Energy acceleration. So, I don’t have any decklists for Standard or Expanded which make good use of Electrode-GX. It should fare better in Expanded, I think, because of cards like Battle Compressor and a wider assortment of Special Energy. I encourage players to experiment, as Electrode-GX might find its value in unusual ways. For either Constructed Format, it might simply be semi-early game Energy acceleration, but it might be insanely crazy late-game shenanigans as a deck risks discarding a bunch of Energy to Crash and Burn-GX before reattaching that Energy to clean-up attackers. It might be a deck’s only Energy acceleration, or it might be an emergency back-up. The fact you have to go through Voltorb to Electrode-GX, and Voltorb is begging to be OHKO’d might even make it useful bait; drop the Voltorb and either your opponent has to OHKO it quickly (likely forcing them to ignore your current attacker) or risk you enjoying a massive Energy spike. You do have to mind your Prize counts; save Extra Energy Bomb for too long, and you might find you’re already too low on Prizes to use it without automatically losing. You really have to mind the Prizes in the Limited Format – both players only begin with four – but you also have a decent chance of attacking with Electrode-GX and surviving, to then use the Ability next turn. 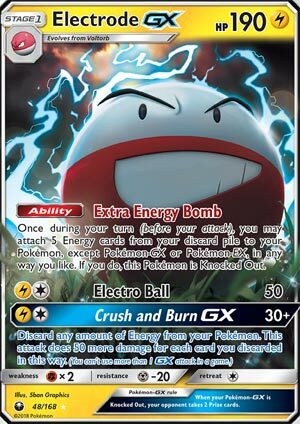 Electrode-GX and its Extra Energy Bomb are an example of a terrific effect at a terrible price. Sooner or later, I think some deck is going to be able to pay that price and power on for a win, but for now, just try to get a few at a decent Price to be prepared for the future. Speaking of which, it isn’t the [L] support of Lost Thunder that Electrode-GX is looking forward to but the Shuckle in the set. No, not Shuckle-GX, but the regular Shuckle; it has an Ability that triggers when you Bench it, letting you toss three basic Energy from your deck into your discard pile. I feel like my thoughts on Electrode-GX are just as easily summarized with Electrode-ex, which we last reviewed back in May. Needless to say, much of my thoughts haven’t really changed, so I’ll just go over the major differences. Electrode-GX has 190 HP, Extra Energy Bomb excludes Pokemon-EX/GX, and he has a generic attack in Electro Ball, which is a 2-for-50 vanilla. Crush and Burn is also now a GX Attack that does 2-for-30 plus an extra 50 damage for any Energy you discard from your Pokemon. Overall, the stats are just buffed up and reworded to match up with today’s game, and luckily Electro Ball and Crush and Burn GX matter so little in light of Extra Energy Bomb. My opinion hasn’t changed on this card for the reason that its main usage – utilizing Extra Energy Bomb to power up a Pokemon absurdly quickly – hasn’t changed either. You might be thinking that he can’t be that great if he can’t power up some of the most powerful Pokemon in the game, to which I’d remind you that Pokemon-GX do evolve from non-EX/GX Pokemon and that Extra Energy Bomb is an Ability, so it doesn’t use your attack for the turn to do so. The risk/reward factor for him remains more-or-less the same, and it just becomes a matter of how you utilize him in your deck, if you’re able to utilize him. Reminder that Electrode-ex, on which Electrode-GX is based off of, ended up as a primary part of a deck that went to Worlds. Arora Notealus: Maybe the best way to test this out is to execute it with a similar build towards the old Bombtar deck – which is to say, try running Electrode-GX at a 2-2 line-up. That way you won’t over-commit to the Bombing and push yourself into bad territory through just the Ability while having enough to frequently play it down onto the field and use that Ability. Try it out, and test it with different decks and Types – remember, the Ability isn’t limited to any specific Type of Energy or any specific kind of Energy.